Less QQ, more Dig dig! Edit: I got an achievement! This is most likely (obviously!) reffering to the QQing of thousands of players over achievements like : "Bloody Rare" and "Northern Exposure"
Though , what puzzles me is why the title Associate Professor? I feel like rerolling an undead warlock named Evil. This is a reference to Indiana Jones and the Last Crusade where Dr. Jones exclaims "That belongs in a museum!" while having some ancient artifact forcibly removed from his hands. Its amazing how many people would not get that. He also says "it belongs in a museum when hes a kid", Talking about the same item. I think that Associate Professor is also a reference to that. Between the name, and the description, this may in fact be the best achievement in game. Here's hoping they don't change it for launch. Hey, they didn't change Bloodsail Admiral. Already on my "To do" list. Anyone going to change there name to evil for hti sto be know as Associate Professor Evil. Must... start... hunting ze achievements! I'd wanta roll a hunter so i could have a crab named Barnaby. The title reward is not Indiana? Color me disappointed. stand around in any capital and say "Good news everyone!" im making my hunter undead and renaming him putricide and get this achievement. Good news, everyone! All your digging in the dirt has finally paid off. Also, you read this in my voice. I'm tempted to get a name change to Utonium for this. Oak wins for most geeky, hands down. Going the Sherlock Holmes route, if I wasn't so attached to my character I would consider renaming (and gender changing) to Moriarty, then go around wearing a tophat or a monocle. How is naming yourself after a character from Pokemon MORE geeky than naming yourself after the leader of the X-Men? I made a character named Frink for the sole purpose of getting this title. I don't see epic in this list - are the Epic artifacts listed elsewhere? Anyone know if you can find 2 of the same rare item? I've been searching for Tyrande's trinket for 3 days straight and I've found every rare Night Elf find except it. Wanting to know how much longer my search will take. Anyone else find it disappointing they changed it to 20 instead of every rare artifact (26 according to ViceVersa's list)? It makes me want to reroll a character called Igor. I'll add another 0.9% to that since I have 19 rares and no repeats. Got this achievement tonight. A few tips for those who are trying to get it. You can travel BETWEEN Twilight Highlands and Stormwind through portal if you did starting quests. You can travel TO Blasted Lands from any major city. Portal is near mage trainer. Death Gate to EPL. Death Knight only spell. Argent Crusader's Tabard. 30min cd teleport to Icecrown. It takes around 25 days to get it if you've never done Argent Tournament dailies. Ring of Kirin Tor. 30min cd? teleport to Dalaran. Pruchase from the JC vendor at Dalaran. Jaina's Locket. 1h CD portal to Dalaran. ICC drop if I remember correctly. Teleport to moonglade. Gratz Druids. Portals from SW to Hyjal/Uldum. Keep in mind that those portals are one way. Unless I completely missed the portals back but I doubt that. There is still Caverns of Time portal in Dalaran so if you have means to get there (tabard, ring, locket) you can use that to get to Tanaris. First mine fragments, don't solve them, until your skill is 100. Then the 'nodes' turn gray and you can only get skill from solving the artifacts. If you're a melee who desires Zin'Rokh I'd suggest to save ALL the troll fragments and just grind EK until your skill is 450. It takes way more time to reach the skill but it has a couple of reasons. First you'll need 450 to be able to discover the weapon. The other reason is that if you hit 450 the Dig Sites will also spawn to Vashjir and Twilight Highlands which contain Nelf and Dwarf fragments. If you're aim is not Zin'Rokh then grind until you have 3/4 or 4/4 of the Dwarf rares. The last one being epic ilvl359 staff. It's 'extra rare' and there's no point to waste your time until later. If you get it, good. If not, move on. Don't worry about fossil rares. The mount needs 300 skill but you'll get more fossils later. Certainly don't worry about Nelf rares. EK has 2 Nelf dig sites before 450 skill. On the other hand Kalimdor has loads of Nelf sites. So, skill 300, on to Outland. Farm until you have all outlands rares. Whopping 3 of them. 2 of the Draenei and 1 Orc. They shouldn't be that hard to get. If you hit 375 before you have them you can always go on and come back later. at 450 you can see Uldum sites. Kalimdor has loads of Night Elf sites, 1 or 2 Dwarf site, few troll sites in Tanaris, Fossil sites in Un'Goro, Tanaris, Desolace, Stonetalon mountains and Tol'Vir sites in Uldum. 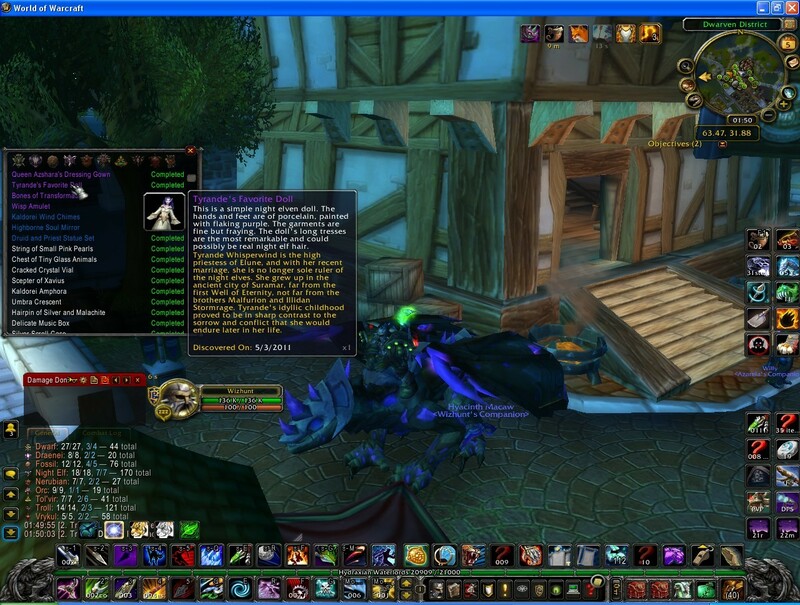 Basically you'll want to get 6/7 of the Night Elf rares before deciding what to do next. Making it total of 16 artifacts. If not then go farm them first. Rest is infamous RNG. I'm guessing that at least 3/6 of Tol'Vir artifacts aren't that rare but getting the sites to spawn there is pain. ps. sorry about the bad writing and formating and etc. I really need to go to sleep now. Will edit this in near future. A little addon to help counting. Because it's hard to count to 20? I'm at 16/20 right now. Solved over 100 dwarf and 200 trolls after I dinged 450. Another mode of transportation is the Argent Crusader's Tabard. From there to Dal, then through the CoT portal, isn't too bad. If I delete the artifacts I already gathered, will I be able to get them again? And if so, will they count..again? Six hours to complete my last rare (last for achievement, no I don't have all 26!) which was thankfully the caster ring from Tol'Vir. Six hours and x3 Heiroglyphs - worst run of sites ever. It'll be even better if you ever get a doctor title on that character. Was very excited to get this title. Spent several days, long hours grinding for it and when the time came...guess what? The title isn't even showing on my list. Nice! GG blizz. I'll update this when it changes but as for now, no title. Rebooted, relogged and now opening up a ticket. If you're like me, and thinking, 'I have found all of the rares and commons, why am I even getting nodes of Fossil still?' -- you can sell some of the grays to vendors for sometimes a few gold. Typically the findings involved in the meta discovery achievements. However, I would prefer if once you've completed all of the findings for a race/type that it no longer appear as a dig site. It's only remaining purpose is to now drain time, interest and raise annoyance. What other profession has that? Keep in mind that blizz also plans to to remove players' excess fragments down to 200 in a future patch (prob the one that will add more ot archeaology). Just wanted to give some personal insight on how I got my professor title. These are listed by the dig type, how many of the available rares I obtained, and how many total solves it took me to get to those rares. night elf trinket I was actually in northrend attempting to get the nerubian blessing. Hopefully this can help some of you plot your course while attempting to get your professor title. run this script to see how many projects you have completed for each race"
Just got this title this morning, Jan 23, 2011. All in all it has been very fun and has been something fun to do. I've spent almost every single day since I dinged 525 archaeology with doing archaeology, and it hasn't become tedious yet. It took me exactly 14 days to get from 525 till I got this achievement. One advice for people going for this achievement, don't take it in one long stroke unless you find it really really fun. Take some breaks, do some archaeology once in a while. So far, so good :) guess I'll just keep digging for more luck. 1081 artifacts total to get this achievement. -In most cases, clearing the closest but crap digsite with 0% rare item possibility will turn out to be more efficient than flying to that farthest digsite with a rare item possibility. By doing so, you will cause a new digsite to spawn with a chance of being a better option, and you will have proceeded through 2 or more digsites instead of spending the time fliying to the other end, just for a single dig. After completing professor I have been working to solve Tol'Vir for the mount and Dwarf for the staff. Consequently, I have 244 Tol'Vir solves and 192 Dwarf solves since my last rare find and still no luck. So..... If anyone can confirm this it would be greatly appreciated! Then I can go back to crying about my terrible rng! I'm at 19 rares after a total of 542 (560) solves. Haven't got any of the "ultra rare" rares yet. About a minute after I posted this I solved another tol'vir common and procced the Scepter. Whilst making the Scepter the Nelf trink also procced... actually finished that first. I added the final numbers in brackets where they were different to my initial post. In patch 4.1, three more rares will probably be added, at least one to troll and at least one to vrykul archaeology, none of which appear to be 'ultra' rare finds. This really grinds my gears. With these three new rares, this title, which previously took a long time and effort to get, will now have its time very significantly cut, as players will no longer need to do any tol'vir archaeology at all for it or grind for any of the ultra rares. Even more annoying considering some players already spent dozens of hours grinding the pointless tol'vir pendant for example only to find there are now much faster to obtain rares which are equally pointless. Note that the patch notes originally said 7 new rares, but that has been corrected because there are only 6. Also there will be up to 4 keystones sometimes from a dig, which will make solving much easier. For Horde the trick is to utilize the portals and hearthstone whilst in Kalimdor and do the sites in groups to avoid wasted time. I haven't had even one ultra rare 359 item drop yet and gave up on them because of there atrocious drop rate. If you want the title just stick to digging for the more common rares to save your sanity. The Tol' Vir dig sites are few and far between and the chances of an ultra rare drop aren't worth the amount of coffee and vodka you'll need to grind it out. It's a bit frustrating seeing a lot of people with this achievement now. Pre 4.1, toons with Professor title are really rare. They should add a new achievement at 25+ rare solves. If they're going to continue following American academic ranks, Professor Emeritus is next. And it would make sense to give it when you have all the rares since you would be done with Archaeology, just as it is generally retiring professors who become emeriti. Next archeology title will be Doctor and it will most likely be 25 or 30 Rare finds. There used to be an armory glitch where it showed you different titles than what you actually had on, using the title Grunt showed me as Relentless Gladiator on the armory. One of the titles showed me as Doctor. At this moment I have 27 of the total 32 rare artifacts (I even got 5/6 Tol'Vir I am just missing the sword) So i really hope Blizzard will add a nice title for having 25 or even 30 rare artifacts. Would be nice considering the effort to get that many rares. I also hope that Blizzard will add a flying mount as project in a future patch (like a fossilized Proto-drake or something). That would really be awesome :). Renaming my main Oak once I get this and the 150 pet achievement. Just 2 more rares and 11 more pets. I SHALL BE KNOWN AS PROFESSOR OAK. GOing to stand in starter zones and give lvl 1s a free pet and ask them if they a boy or a girl and what my grandsons name is. Professor Treadwise...I like the ring to that. Finished my 20th and 21st rares tonight. 2 of them are ultra rares...the Extinct Turtle Shell and Zin'rokh, Destroyer of Worlds . I plan on keeping at it until i have them all. What i expect is that Blizz will add more achieves with the Pandaria expansion. With a little expectation that they may add one race at minimum and quite possibly they could add up to three. Pandaran, Goblin and Human are missing from the profession. Letting this profession remain stagnant would be a shame. Today must have been my lucky day...I got the Scepter of Azj' Aqir. This is my 2nd Tol'vir rare...the other was the Ring of the Boy Emperor. Only 3 more to complete for my 20. I am also on my 2nd Canopic jar...too bad I am a JC and not an Alchy. After completing the quest Flying Colors, i was granted this achivement. Same happened a short time earlier, when I got the 10 rare artifacts achivement, which was when I completed the quest where he hands out tasks for you. I was also granted Diggerest along with diggerest. I can use the titles and I got points. I have completed 5 rare artifacts and 43 commons. This is obviously a bug but who knows, maybe you can keep it after they fix it. But I just wanted to get the information out there, and I would also like to know if this has happened to someone else? I too have my achievement reset from 19/20, and was at 2/20 yesterday. I logged in today and found it at 1/20 again. I managed to get this title today by a weird quest bug. All I did was turn in The Great Banquet and I got this achievement, along with Diggerest. So did the person beside me. It was on my human paladin (the other person was also human, in case that matters), and I previously had 525 arch with only 82 commons and 12 rares. I put in a ticket with Blizz, but in case they decide not to take it away, enjoy this super easy way to get this great title. 1.2) For achievement hunters: wait for hallow's end event you will get instant cast on flying with the magic broom. 2) Try to do the achievement Draenor Curator ( all pristines) first: you will get at least 350 crates to complete olders xpac archeology at the seat of knowledge by buying fragments. Truth: If you continue to dig for achievements every Xpac you will become an artifact yourself! This achievement is far easier to obtain through Legion archeology. Archeology has been shifted to "rare finds" being a part of questlines. As so you are able to obtain 13/20 without RNG. The changes are cited in this guide. The legion quests are a part of the achievement, This Side Up. They appear in sequence once a week from the Archeology vendor in Dalaran, Dariness the Learned, these quests appear on your map when they spawn. The rest of the comments procedures on how to farm the other 7 rares are still of use. Though hopefully, after Legion, this new style of archeology will remain and therefore be easier still. You shall be granted the title "Professor"